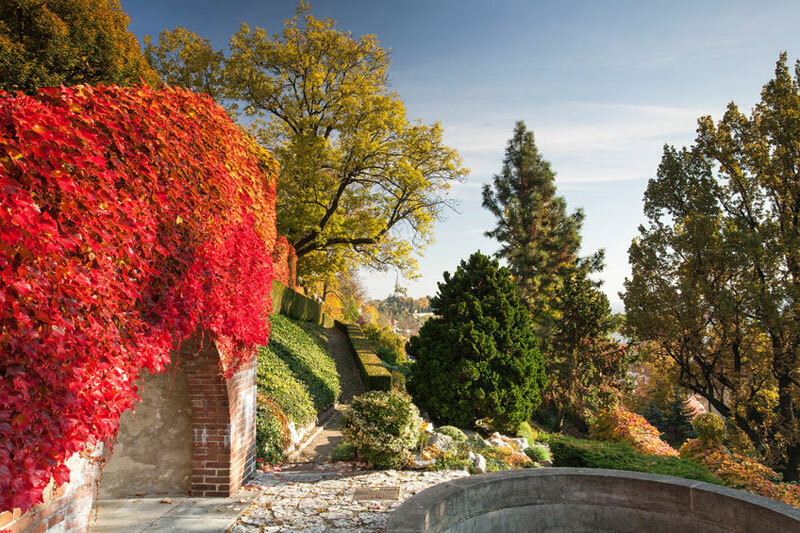 If you want to enjoy the maximum of Prague’s Autumn beauty, climb up the romantic Petřín Hill. Formerly one of King Charles’s vineyards, this hill offers beautiful views of Prague and several attractions for adults and children, too. 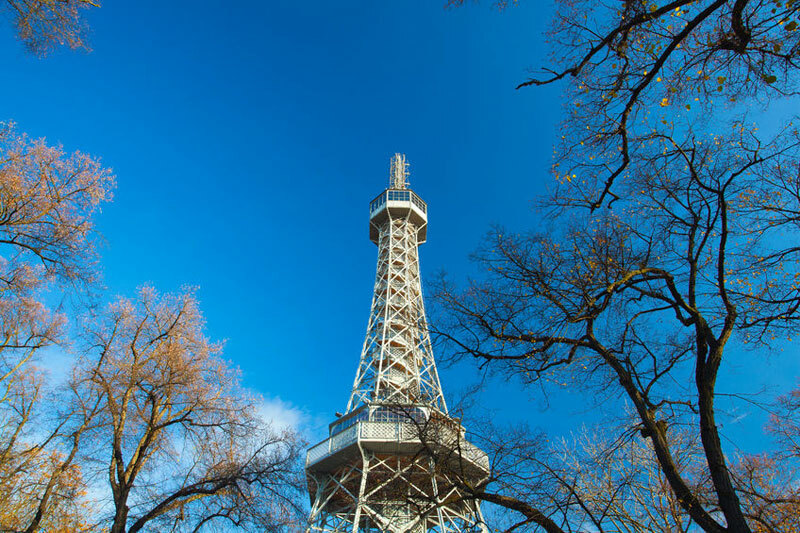 From the Petřín Hill Observation Tower, you can admire the autumn leaves in the city, since it offers sweeping views of Prague. Kids and lovers are constantly drawn to the 299-step faux Eiffel Tower, mirror maze and Štefánik Observatory. You can take the famous funicular (from “Újezd” tram station, if you go by public transport) to go up and you will only need your tram ticket. The tower is open from 10 a. m. till 10 p. m. in September, 8 p. m. in October, and 6 p. m. in November, for an entrance fee of 120 CZK. The famous Mirror Maze has the same opening hours and the entrance fee is 75 CZK. The average monthly temperatures in Prague during the year are shown in the table and charts below, both in Celsius and Fahrenheit. Temperatures in fall are really unpredictable because it’s the time when Prague is moving from summer to cold winter. So you can experience 21°C (67°F) in September and -1°C (30°F) in November. For more details, read below about the climate in specific fall months (September, October, and November). Autumn in Prague is typically dry as it is the second less rainy period throughout the year. At the end of November, the first snow begins to fall. 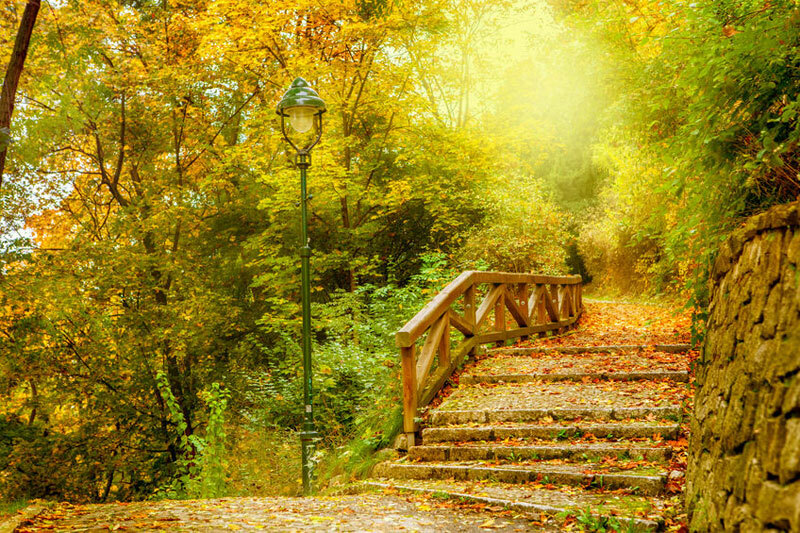 Especially in September, there is a high chance of clear and warm days, a so-called Indian summer day. After July and August – the hottest months of the year for Prague, the weather starts to cool down in September, when summer is slowly turning into autumn. At this time of year, the average temperature for the city starts off at 16°C (61°F), with highs of 21°C (67°F) during the daytime and lows of 11°C (52°F) after dark. OUR TIP September is really famous for young sweet wine called “burcak” and there are many wine tasting festivals (“vinobrani”) in/around Prague. Check out the full list in Rosie’s post Young wine, Fun and Festivals: Get the Most out of the Last Days of Summer. If it is its cultural aspects that attracted you to Prague, then you should not miss The Dvořák Prague Festival, taking place every September since 2008. This international music festival is not only a celebration of the musical genius of Antonín Dvořák, the world’s most renowned Czech composer, but it is also considered an important social event. The festival is a display of excellent performers, conductors and world-famous orchestras and chamber ensembles, coming together in Prague to present not only Dvořák’s music but also works of other celebrated composers to the international audience of the Czech capital. If you prefer more leisurely events and want to experience the real youthful fun of Prague, there is the LadronkaFest taking place in September. The aim of the biggest festival of leisure activities in Central Europe is to introduce and offer young people some high-quality leisure time. LadronkaFest, taking place at Břevnov (Tomanova street 1028/1), brings together sport, culture, music, art, adrenalin, shows, and entertainment. Visitors can try out all sorts of sports or creative workshops and enjoy an attractive accompanying cultural and entertainment program (concerts, DJ ‘s, breakdancing, etc.) and exciting exhibitions of extreme sports, such as popular parkour. Entry, and all the activities are free of charge. In October, the temperatures continue to cool down, so that by the end of the month the average temperatures in Prague are 5,5°C (42°F) during the day and 2°C (36°F) after dark. From the tourist’s point of view, the Czech Republic’s capital is even less crowded than in September. Thus, in October you have a rare opportunity to have your picture with the background of the Prague´s Old Town Astronomical Clock, without having strange people in it. If you come to Prague at the end of October, you can celebrate Halloween here. It is not a traditional holiday in the Czech Republic, but Czechs adopt many foreign holidays and use all possible opportunities to celebrate and have fun. One of the fanciest Halloween parties has been taking place in SaSaZu restaurant and club in recent years. The event has sold out every single year, and the promoters always encourage the visitors to wear the craziest costumes possible and go wild. SaSaZu is – quite originally – located at the Prague market Holešovice (Bubenské nábřeží 306/13). In November, when Winter is near, the average temperatures vary from 9°C (48°F) to -1°C (30°F). Historically, the first snow used to appear in this month and there is a saying that “St. Martin arrives on a white rose”. The name-day of Martin (St. Martin’s Day) is on the 11th of November, but there has been no snow on this date (or before it) for many years. But even though Martin may no longer bring snow, his name-day is enthusiastically expected in the Czech Republic. This is because on the 11th of November Czechs traditionally open and drink the young wine of the year, the first wine from the autumn harvest, for the first time. The wine is called “svatomartinské” (referring to the St. Martin´s Day) and there is a tradition of a special feast (“Svatomartinské hody”), where the main dish is a goose with dumplings and cabbage. This celebration is very similar to the French one – called “Beaujolais Noveau”. However, the Czech ritual has been in existence surprisingly longer than the one in France. So if you are a real “gastronomical” tourist, who always wants to try the true local traditional specials, you should not miss the St. Martin’s Day’s celebration, organized every year in almost any Prague restaurant. The St. Martin’s Day festivities also take place in public areas, for example in the Prague Botanical Garden or at the so-called “Náplavka” – on the Vltava river embankment (Rašínovo nábřeží).